Do Emotions Sell? Or Are They Just So Much Entertainment? 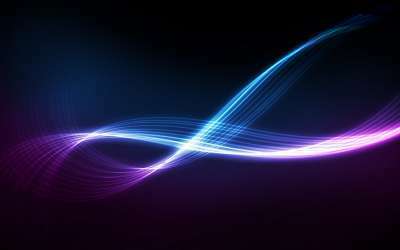 Blog » Marketing » Do Emotions Sell? Or Are They Just Entertainment? Do Emotions Sell? Or Are They Just Entertainment? Most of us don’t like over-hyped sales pitches. We avoid used car salesmen…. We fast forward through commercials…. We exit sales pages that appear to scream at us. But what about emotional advertising? That got my curiosity up—I had to watch. It also got me thinking. Most people are becoming immune to hyped sales pitches. We like ads that seem more honest and trustworthy. Is this the solution? Have we entered a time when beautiful, emotionally stirring promotions sell best? Or do we see emotional ads as “short films,” entertaining and worth sharing, but nothing more? See what I mean. It packs an emotional punch without raising the volume. You find yourself absorbed by the story, eager to watch—and you walk away liking the brand better. Psychologists have found that emotions do sell. We buy for emotional reasons, falling back on logic only when we want to tell our friends about the purchase, feel better about it, or explain why the credit card took such a hit last month. Yet most of our marketing isn’t emotional at all. Once we remove all hype, we’re left with pure benefits and features, as if a logical sales pitch is all that’s needed to convince and convert our audience. Where’s the drama? Where’s the story? Where’s the emotional hook that makes people want your product? People are so busy, they don’t have time to stick with a boring sales presentation. Besides, they hate being sold to. So without at least a touch of emotion, you’re not likely to get people watching or reading… and certainly not buying. 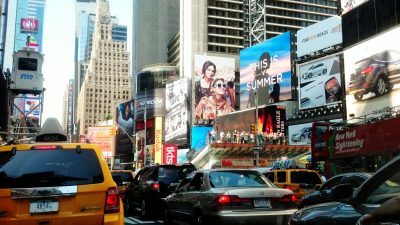 Is the solution to build an emotional brand? Creating an emotional sales pitch is easier if you’ve built your brand around an emotion. Chevrolet, for instance, has the tag, “Chevy runs deep.” Let’s face it, there’s not much you can’t do with that one. Their ads range from silly to funny to poignant. It’s emotional, but not in a tear-jerking sort of way. It connects the brand with family, fully supporting the idea that Chevy runs deep. But you don’t have to have an emotional brand to do the same type of marketing. Guinness doesn’t have an emotional brand, but it does know how to tell a story. Look at this description of their draught beer. 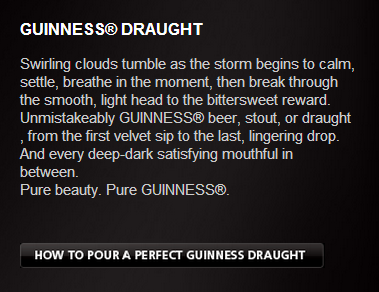 This is a luscious description, all but creating an aura around the beer. Who doesn’t want a “velvet sip” of a “bittersweet reward”? Irresistible, right? Sharable too—when my son heard what I was writing about, he immediately called this one up on YouTube. Clearly, marketing that arouses emotions also engages people. They want to share these stories with their friends, which means you have a good chance of going viral—getting free advertising from shares alone. The point of marketing is to get results. We don’t build websites to sit there and look pretty. Nor do we want a lot of shares unless they lead to bottom-line sales. Big-name ad agencies often forget this. They craft entertaining ads that viewers are willing to watch even during commercial breaks, using drama, humor and entertainment to keep us tuned in. But do these ads get results? Because they’re entertaining, we’ll talk about them with our friends. But in most cases, even if we’re sharing these commercials, we don’t remember what products they support. That’s because these ads rarely make the connection between story and product. In short, they don’t get results. Yes, it’s important to create something that people will read or view. But we need to remember to focus on results. We need to sell as well as entertain. Does it have to be a “story”? When you want to build rapport with your readers, stories are a fantastic tool. But other methods can work too. You need a publisher, not a problem. In fact, it’s so perfect, nothing else needs to be said. This statement calls to mind all sorts of bad memories for anyone who has ever tried to self-publish… and the worst fears of wanna-be self-publishers. After reading it, they’re hooked and want to read more. Another option is to tell people a little about yourself. 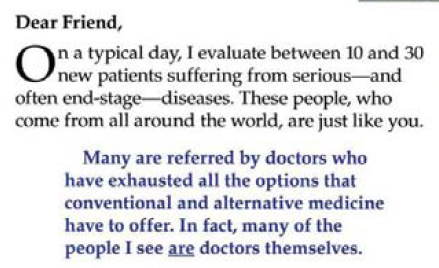 Here’s an example from my swipe file, a 2006 promo from Dr. Bruce West’s Health Alert. This one works because it refers to people who are suffering. Your sympathy is aroused and you want to keep reading to learn more—especially if you share these problems. Neither of these promotions are as emotional as the Tai video. Neither tells a sustained story. But both work. They target their audience and capture their attention in a way that keeps them reading. You don’t need to make people cry, but you do want them to feel something. Make them laugh. Or get them to nod their head. In most cases, that’s enough to build rapport and get the sales process moving. One word of warning: Don’t lean too heavily on emotions. Sometimes you can get a bigger response by being subtle. So tread lightly. Your goal is to engage your audience, not manipulate them. To do that, tell a story (or a piece of one). Talk about an issue that’s important to them. Above all, make them care. Build your promo on a solid foundation. It’s good to make people feel something. But emotions just prime the pump. You need to translate those emotions into action. That’s where your sales pitch comes in. And the nice thing is, you don’t need hype or over-selling to drive action when you’ve already stirred people’s emotions. This is the Abbott Press promotion whose first line we looked at above. Their target audience is writers, in most cases, budding authors who are considering self-publishing. This is a short, punchy headline that gets to the heart of a writer’s concerns. After all the energy of creating a book manuscript, he wants it published, sure. But he wants it done right. One sentence is all that’s needed if it’s done right. Abbott communicates that they understand everything you might be feeling. And they phrase it in a way that gets you nodding. They could have said more, but there’s no need to belabor the point once it’s made. 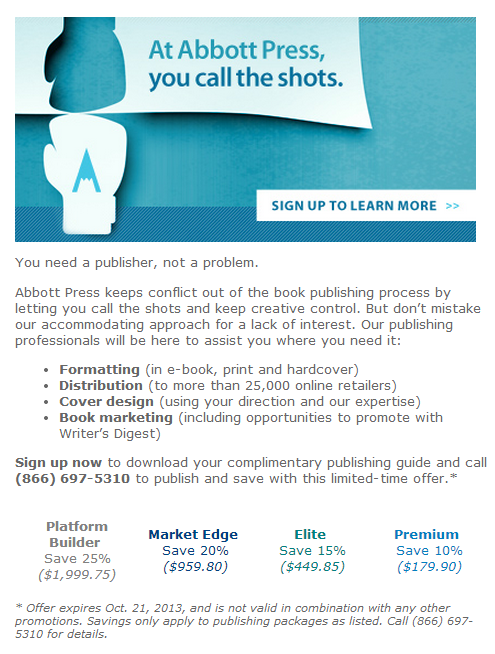 Abbott Press keeps conflict out of the book publishing process by letting you call the shots and keep creative control. But don’t mistake our accommodating approach for a lack of interest. Our publishing professionals will be here to assist you where you need it. “No conflict” addresses the writer’s fears. “Letting you call the shots” hits his creative pride. The words “publishing professionals” builds security. A writer isn’t stepping out alone. He’s working with experienced pros who can help him avoid mistakes. See what I mean? This hits a lot of emotions and drivers for the target audience. Yet there’s no tear-jerking story. And no hype either. Because the emotional pitch is low-key, you hardly even notice it. Meanwhile, you’re drawn in by a strong sales pitch that addresses all those emotions. Sign up now to download your complimentary publishing guide and call (866) 697-5310 to publish and save with this limited-time offer. Sign up to download a guide. Call to publish and save. See how simple this is? You don’t need a long, drawn-out story. You only need to know your audience and what makes them tick. When writing your promotions—whether video or print or another medium—incorporate emotional logic into your presentation. On the whole, hype doesn’t work. But pure emotion without a sales pitch can’t get results either. Your best bet is to weave psychological drivers into your sales pitch—using emotions to make your readers care and a sales pitch to close the deal. Start with an emotional hook. Try something that generates a strong feeling or gets people nodding in agreement. Make a bold promise (and prove you can deliver). Introduce your product as the hero. Their emotions are stirred… make them fall in love. Then make a simple call to action. What do you think? 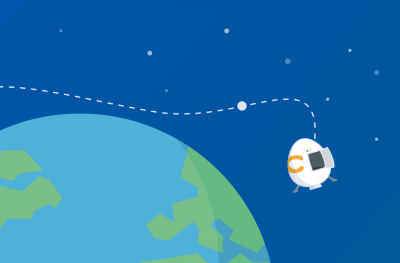 Is emotional selling easier or harder than hype? Which do you think works best? Kathryn Aragon is the former editor of The Daily Egg. She's a content strategist, consultant, and author of The Business Blog Handbook. Learn more at KathrynAragon.com. Follow her on Twitter.